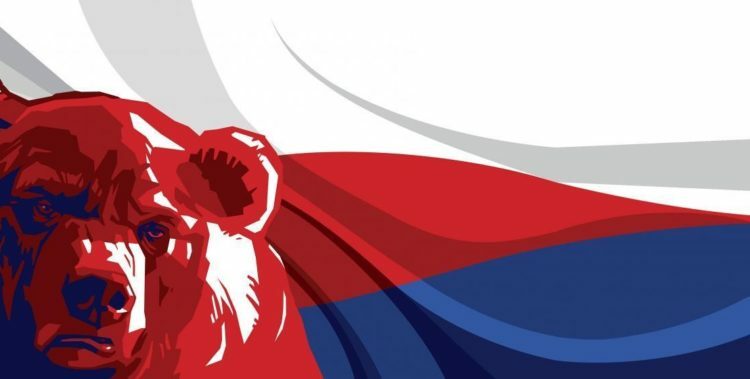 In this article, we will suggest some reasons to consider an investment in the Russian economy, by first introducing the international economic environment, then the specific Russian economy and finally provide an investment strategy. Why to Invest in Russia? The purpose of the article is to show why an investment in Russia could be very useful for diversification purposes of a financial portfolio. First, it is important to remember that the Russian economy is highly uncorrelated to the other major world economies. GDP growth rate of major economies (Source: Trading Economics). 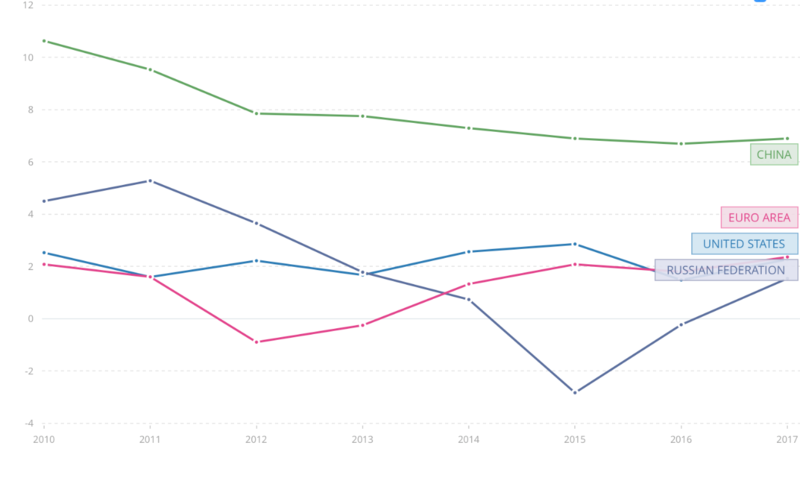 This chart shows the GDP growth rate of China, US, Euro Area and Russia since 2010. It can be noticed that since 2010, the major world economies have started to grow after years of recession with the exception of Russia that during 2014, experienced a big recession (The Euro Area shows a negative GDP growth in 2012 because of peripherals countries, even though France and Germany were already growing). An investment in Russia is particularly interesting for all investors who believe that, being the most important economies in the late part of the cycle, it’s important to invest in defensive assets. This data might be perceived as worrying for a prudent investor. Even if it is not certain that a high debt implies a recession, everyone agree that high level of debt makes the economy more vulnerable: first of all for a country highly indebted a slowdown of growth might create large problems to reach a balanced budget. For instance, if the economy grows 4% annually and the deficit is 4%, there is a momentary stability until economy slowdowns. The other issue is that a highly indebted country will hardly find additional capital to borrow in case of recession because creditor will prefer to lend to less indebted countries. In western countries, during this late part of the decade, investors and financial newspapers have started talking about how to modify the allocation of a financial portfolio in case of economic slowdown, recession or market tumble. The sentiment, that was positive before the US tax reform, is getting neutral or negative. Between financial operators, is emerging the idea that this bull market might still go up, but that is destined to get worse in a few years. Based with the premise that nobody knows what will happen in the next years (economic slowdown, recession, difficulties in financing public deficit or a financial crisis), what is certain is that the horizon appears darker compared to 2010, when western economies exited the recession. An investment in Russia is interesting because makes it possible to buy asset in an economy that is living a phase similar to our 2010-2011. First of all, it should be recalled that Russian economy is completely different from the western ones by composition of GDP: If US and EU can be defined as consumption societies, and access to credit can be considered as a basic parameter, in Russia the basic parameter is Oil and natural gas export. About two third of the export price get transferred to the State through taxation which generates around 70% of tax revenue. For the next years, the perspective of growth for Oil’s demand are 1%/1.5% annually, according to both OPEC and IEA. Furthermore, Russia and Saudi Arabia might replace the supply of Iran, affected by US sanctions. The export of oil and natural gas influence the GDP growth rate and the Russian deficit as well as the value of the Ruble. The candle-stick represent the Brent price while the purple line represent RUB/USD exchange rate. As it can be noticed by the chart, there exists a great correlation between the value of the Ruble and the price of Brent oil. From 2004 to 2008, following the increase in value of the Brent, the Ruble appreciated on both US Dollar and Euro. Equally, the same correlation can be observed during 2008 crash and from 2009 economic recovery. 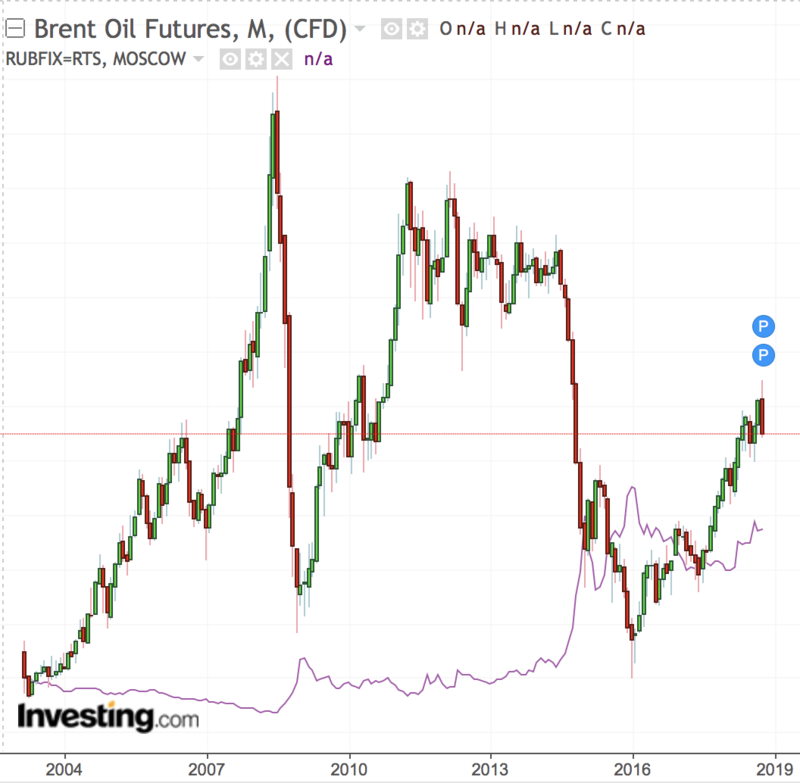 What is really astonishing, is the strength of the correlation during the 2015 crash of Oil price: to justify this escape from the Ruble, the correlation with price of Brent isn’t enough. In fact, it should be recalled that during 2014 were launched many sanctions from EU and US authorities against Russia, following the military conflict in Crimea against Ukraine. All these factors have triggered the escape of foreign investors from the Russian financial market. It is suggested an investment on ETF dollar-denominated or buying directly the stocks of the major Russian societies in Rubles. We highly recommend to diversify the investment in more societies to reduce the specific risk: in Russia, transparency rules aren’t very effective. The investment ruble-denominated is suggested to reduce the volatility of the exchange rate: in fact, an investment dollar-denominated would also fluctuate because exchange-rate expectations. The expectation of this investment concern both the economic recovery of Russia and the appreciation of the Ruble in the next years against US dollar and Euro: in fact, considering the low level of sovereign debt to GDP ratio, rarely the Russian central bank will have to start operations of QE or printing money, very likely in Europe and in US. Furthermore, the price of Brent now at $77 dollars, might rise longer leading an appreciation of the exchange rate. Finally, the sanctions against Russia might end within five years and once terminate, a great amount of foreign capital might converge into the Russian financial markets. The investment strategy is a simple “Buy and Hold” with a time horizon between 5 and 10 years concerning a percentage of portfolio around 15%. ETF US dollar-denominated that invest 92% of its capital in Russia and Est Europe, 5% in UK and 3% in Latin America. The principal sectors of investment are: Energy 42%, Commodities 21%, finance 12%, telecommunications 8% and technology 7%. ETF US dollar-denominated that invest the 98% of its capital in Russia and Est Europe and the 2% in UK. The capital is allocated in many sectors: the 62% on Energy, 19% on Finance, 13% on commodities, 4% on defensive Consumer Goods and 2% in Communications.